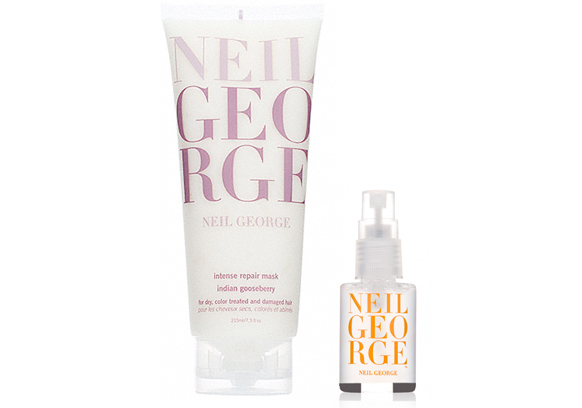 Use the Neil George Indian Gooseberry Oil to make hair soft, shiny, and protect it from sun and heat damage. The Neil George line offers many products with Indian Gooseberry, our signature ingredient, because it literally is like vitamins for your hair. Indian Gooseberry (also known as Amla) has actually been used for thousands of years by women in India because of its rich antioxidant properties (over 10x more Vitamin C than an orange) and its ability to both enrich hair growth and strengthen the roots of the hair. We love how the antioxidants add shine, smooth and calm sun-damaged hair while making it soft and manageable. Our number one recommendation for our Indian Gooseberry Treatment Oil is to use it on wet hair before blow drying –not only will it reduce the amount of time it takes to blow dry your hair but you will instantly notice your hair feeling soft, smoother, and luxurious. Other Neil George products that include our signature Indian Gooseberry ingredient are the Intense Repair Mask, Intense Illuminating Shampoo and Conditioner, Pure Shot: Intense Repair Treatment Spray, and the Perfect Hold Hairspray. See all of our products by visiting our site at neilgeorgeshop.com. This entry was posted in Pro Tips, Products, Recent Posts and tagged best hair mask, best hair oil, best shampoo for soft hair, frizz control, hair growth, hair supplements, hair treatment at home, hair vitamins, indian gooseberry, indian gooseberry oil, intense repair mask, oil treatment, perfect hold hairspray, Pure Shot, shiny hair products. Bookmark the permalink.